in eve, Ellery at home except when with her little Friday December 26 Still cold enough but Mer stood 20°_ at noon & 2°+ at sun-set. Up early at George's (where I spent the night) where I took breakfast, coming home soon as tho't house would be warm. I helped Lena make couple pies, after doing up chores, after which she was shopping. 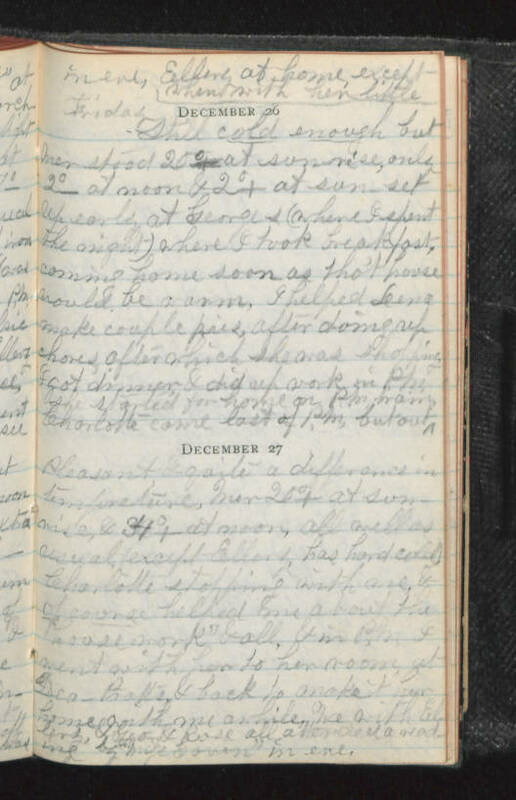 I got dinner & did up work in P.M. She started for home on P.M. train, Charlotte came last of P.M. but out December 27 Pleasant, & quite a difference in temperature, Mer 20°+ at sun-rise, & 34°+ at noon, all well as usual (except Ellery has hard cold) Charlotte stopping with me & of course helped me about the "house work" & all, & in P.M. I went with her to her room, at tea - Pratts & back to make it her home with me awhile. We with Ellery, & Geo & Rose all attended a reading by "Miss Goven" in eve.